An authentic Chevrolet shirt featuring a Chevy Corvette Stingray. An original vintage iron-on heat transfer print on a new and unused shirt. "Corvette Summer?" Nah, but it sure is cooll! 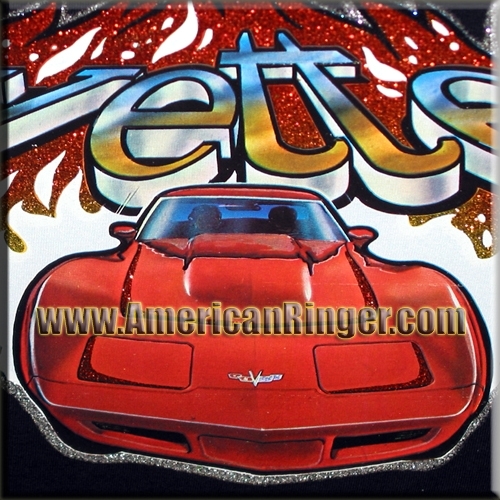 This Corvette Stingray vintage t-shirt is as cool today as the day the Vette was first released. A truly rare find that American Ringer has acquired and NOBODY ELSE has! This is the real deal vintage stuff only available from American Ringer. This American muscle car vintage t-shirt is very limited and once they are gone they will be gone forever.